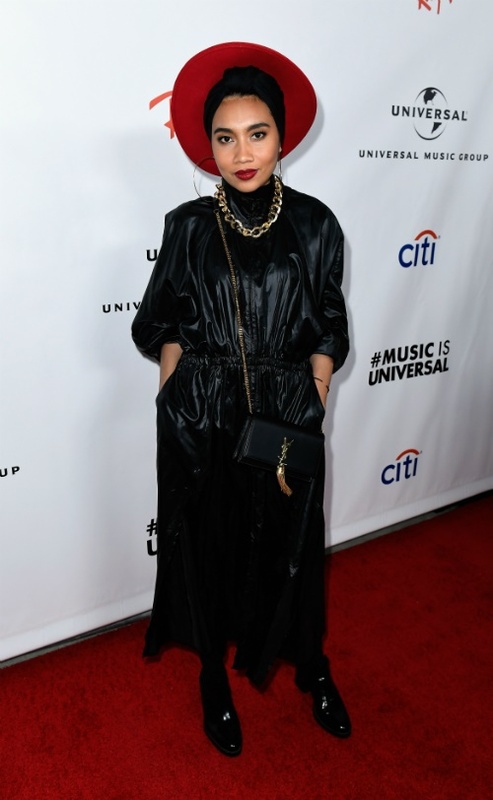 And these were the looks that made us do a 360-degree headturn at the Grammy Awards last night. The 61st Annual Grammy Awards took place last night (3am for us), "celebrating, honouring, and sustaining music's past, present, and future." 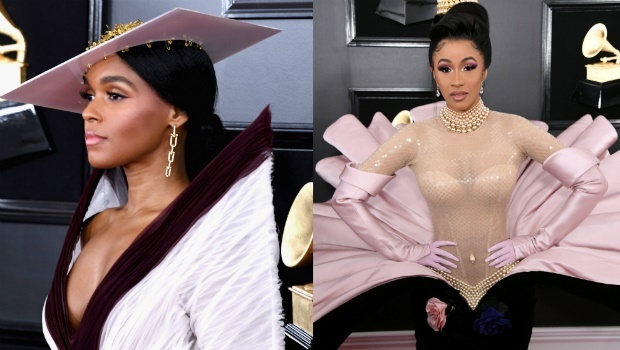 The Grammys are not only a musical extravaganza, where we see our favourite artists outperform their previous stellar musical offerings, but it's also one of the most sartorially fascinating and diverse red carpets - from semi-formal looks to haute couture gowns straight off the runway. One actually wonders what the official dress code actually is, but we're wowed every year nonetheless. 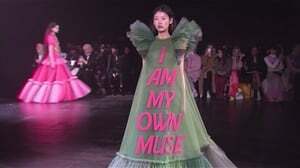 This year, it would appear that celebrity stylists collaborated with designers to exhibit avant garde, futuristic, 3D gowns and accessories - a common trend spotted at Paris Haute Couture Fashion Week a few weeks ago. Classic, traditional silhouettes have not been tossed out the limo window, though, and a few A-listers still looked remarkable in their chosen dresses. What is interesting, however, is that the stars who usually embrace the classics, tried their hand (and hips) at more breathable fits and opted for the offbeat glam we love from the runway. One such example is Kylie Jenner's Grammys debut look. 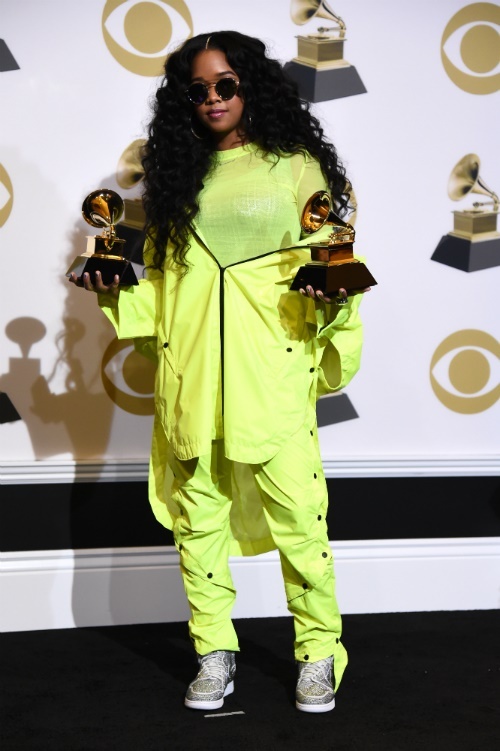 This reality TV star and beauty mogul is known for her "feline" style that is all about accentuating her favourite features and is easy to emulate, but at the Grammys she surprised us in a custom pink Balmain (a family fave) jumpsuit. The fit could have been slightly more tailored, otherwise we'd love to see the 21-year-old in more high fashion looks that are as intricately designed as this jumpsuit. 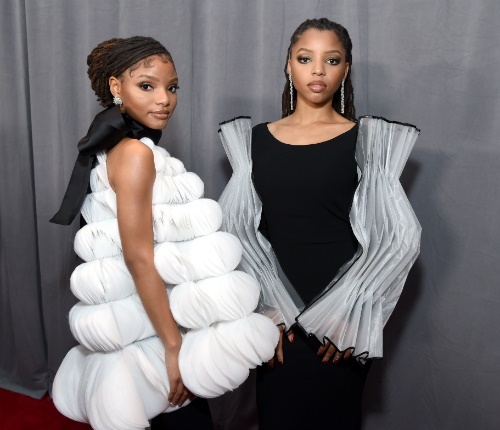 Also making their Grammys debut in the sartorially weird and oh-so-wonderful were talented sister duo Chloe x Halle Bailey. Styled by Zerina Akers. 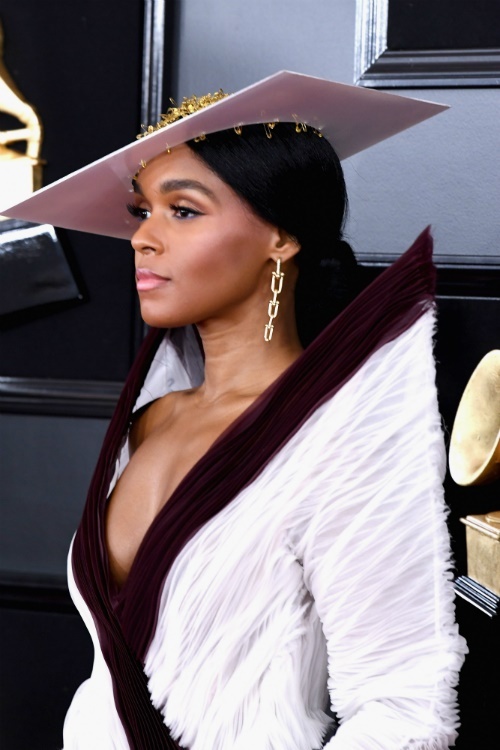 Janelle Monáe - a musician who has dedicated her entire discography and style to futuristic funk and Afrofuturism, gave us shapes, pleats, architecture, gold safety pins and decolletage. There's clearly nothing dirty about this computer because we love this look. Icons of now, J-Lo and Lady Gaga, united in silver and white respectively. Plus, the hat that tur.. I mean, bumped heads. Another halo effect hat, styled in a semi-formal meets festival-ready look, was seen on Yuna - a star whose tracks always manage to put us in our feels. 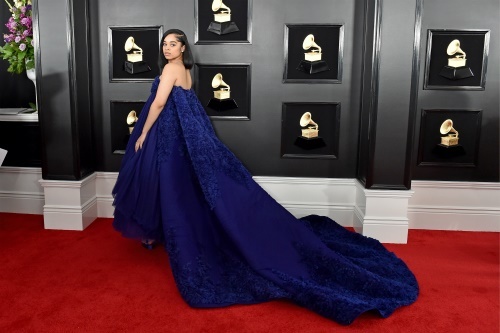 And the woman of the moment, Belcalis Marlenis Almánzar (Cardi B), who recently graced the cover of Harper's Bazaar like we've never seen before, showed up and showed off in Thierry Mugler. If this is not the next Thierry Mugler fragrance bottle design, they're all wasting our time. Red carpet-sweeping gowns will never not get us talking. Jada Pinkett-Smith and songstress Ella Mai got it just right with their over-the-shoulder pose that somehow always tends to make such gowns slightly more dramatic than they already are. 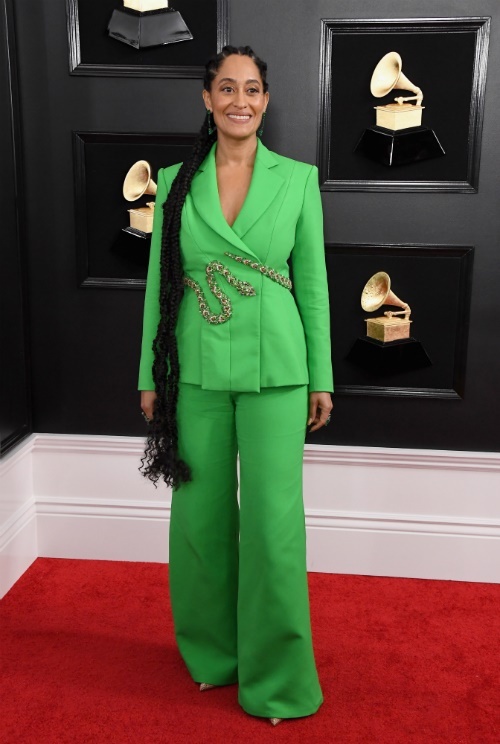 Neon, bold and bright - Tracee Ellis Ross (T.E.R) and singer H.E.R sported this trends in different variations of the suit. Tracee in a classic Ralph & Rousso couture suit and H.E.R in an edgy sports luxe "suit." 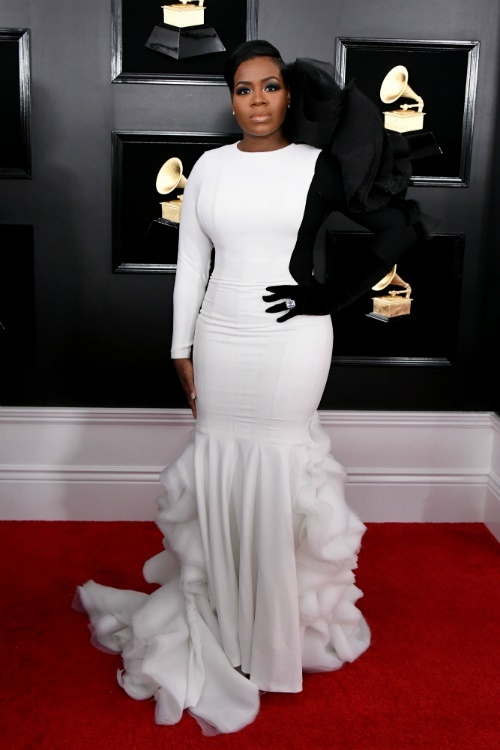 Fantasia hit a very high style note with this ying yang body-hugging gown. On any other occasion tulle on your shoulder and ruffles on the tail of the dress might have been a bit much, but this works. Well done to her stylist Daniel Hawkins. Bebe Rhexa's red Monsoori tulle ballgown was just the cherry on top the delectable Grammys red carpet needed.